Electronic gadgets and accessories can easily get lost in packs, or even worse--left behind. 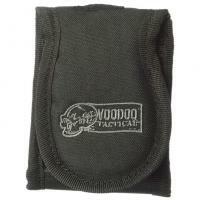 Not anymore thanks to Voodoo Tactical's Electronic Gadget Pouch. Constructed from rugged pack cloth, the carrier offers extreme durability and maximum protection of valuables. Measuring three by four inches, the pouch easily holds cellphones, a GPS or other small electronic devices. Its universal straps are MOLLE-compatible, allowing for convenient attachment and reliable carry on belts, vests, tactical outerwear and other webbed platforms. Double-stitched seams and reinforced stress points ensure valuables stay close at hand when they are needed most.